SOUTHINGTON - The way the Southington football team approaches Friday nights, it doesn’t matter if an opponent is undefeated, has five wins or is winless. Every game is important, especially at this point of the season. And that’s why the Blue Knights (8-0) aren’t looking past South Windsor (0-8) tonight. That mentality has worked so far. The Blue Knights are scoring an average of 36.0 points a game, including 43.7 since their midseason bye week, and have only given up an average of 13.0 on defense this season. They would certainly like for that to continue that tonight. The Bobcats at this point are far removed from the team that went 8-2 in 2017 - including a 30-27 win over Southington that essentially knocked the Blue Knights out of the playoffs - and reached the Class LL semifinals. South Windsor has managed 68 total points this season, 20 of which came in a 41-20 loss to Hall last week. Some of the steps backward for South Windsor have to do with the number of players it graduated, among them quarterback Connor Kapisak, running backs Julian Ibes and James Tamburro, wide receiver Colin Ryan and offense/defensive linemen Dylan Hodge and Alex Valente. In other words, it’s been full-on rebuilding mode for the Bobcats with senior tailbacks Ronnie Pinkard and Royale Richards as the only two with considerable varsity experience before the year began. And Southington, like most other opponents South Windsor has faced, is expecting a heavy dosage of the run. Pinkard has rushed for 510 yards and two touchdowns in seven games this season and will be the Bobcats’ biggest threat. He also leads the team in receiving with 116 yards. Richards has just 103 yards of total offense, but his biggest contribution is on the defensive side of the ball. Offensively, the Blue Knights will look to keep their own running game going. 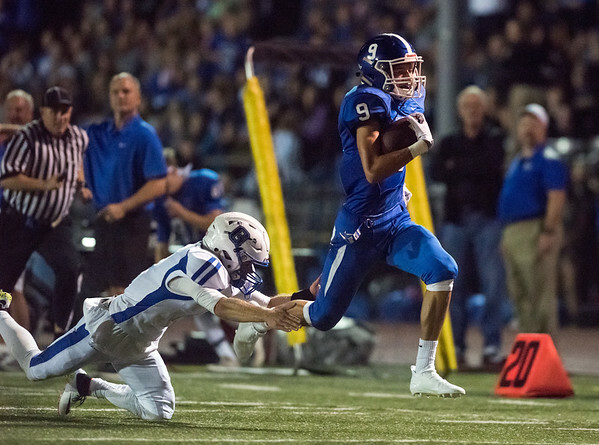 Southington is coming off back-to-back weeks in which it topped the 200-yard mark on the ground. The team ran for 211 last week against Enfield with Tanner LaRosa running for more than 100 yards for the second consecutive game as well. The Blue Knights now have 1,055 rushing yards on the season to bring some much-needed balance to their offense. At the same time, Pinkard and Richards will both be key components for the Bobcats’ defense, Pinkard as the middle linebacker and Richards on the outside. Richards leads South Windsor with 46 tackles, including 11 for loss. But neither should be able to have much of an impact against Southington. As a whole, the Bobcats have allowed teams to score an average of 37.8 points per game. The fewest they’ve allowed was 20 to Newington in Week 4. If Southington is as attentive Friday night as it was during the week of practice, it shouldn’t be much of a problem. Posted in New Britain Herald, Southington on Thursday, 8 November 2018 20:04. Updated: Thursday, 8 November 2018 20:06.